More than any other medium, watercolour relies upon the variable characteristics of the pigments used. 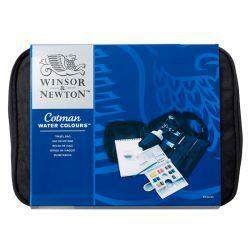 Offering a carefully chosen spectrum of 40 colours, Winsor & Newton’s Cotman Water Colours have been created using high-quality pigments at affordable prices. 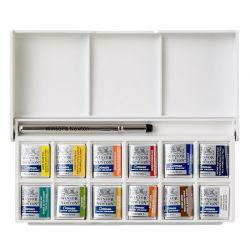 This introductory set includes 12 x 8ml tubes of Cotman Watercolour paints that are ideal for newcomers to watercolour painting. Included colours: Cadmium Yellow Hue, Cadmium Red Pale Hue, Alizarin Crimson Hue, Ultramarine, Cerulean Blue Hue, Prussian Blue, Viridian Hue, Yellow Ochre, Burnt Sienna, Burnt Umber, Ivory Black and Chinese White. 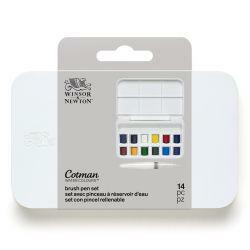 I bought these to try liquid watercolours, moving away from the blocks. They are great to work with and I would recommend anyone try them.